Carmarthen ( ; Welsh: Caerfyrddin [kɑːɨrˈvərðɪn], "Merlin's fort") is a community in, and the county town of, Carmarthenshire, Wales. It is on the River Towy 8 miles (13 km) north of its mouth at Carmarthen Bay. In 2001, the population was 15,854. Carmarthen has a strong claim to being the oldest town in Wales, but the two settlements of Old and New Carmarthen were only united into a single borough in 1546. 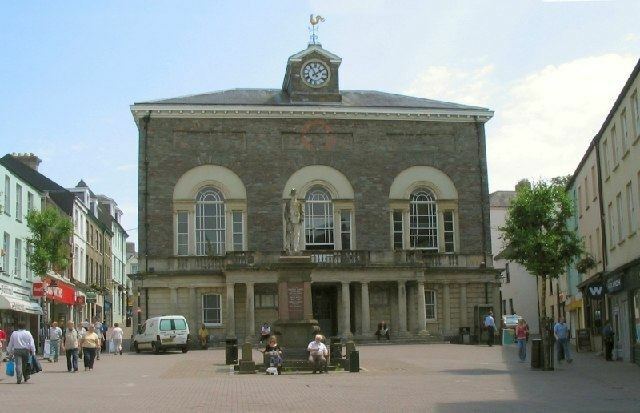 Carmarthen was the most populous borough in Wales between the 16th and 18th centuries and was described by William Camden as "the chief citie of the country". However, population growth stagnated by the mid-19th century as more dynamic economic centres developed in the South Wales coalfield. Carmarthen is the location of Dyfed-Powys Police headquarters, the Carmarthen campus of the University of Wales, Trinity Saint David and Glangwili General Hospital. The ancient Clas church of Llandeulyddog was the pre-Norman independent religious community which became, in 1110, the Benedictine Priory of St Peter, only to be replaced 15 years later with the Augustianian Priory of St John the Evangelist and St Teulyddog. This was sited near the river, at what is now Priory Street (51.8601°N 4.2975°W﻿ / 51.8601; -4.2975﻿ (St John's Priory), SN418204). The site is now a scheduled monument. During the 13th century, Franciscan Friars (also known as Grey Friars, or Friars minor) became established in the town, and by 1284 had their own Friary buildings on Lammas Street (51.855794°N 4.309076°W﻿ / 51.855794; -4.309076﻿ (Carmarthen Greyfriars)), on a site now occupied by a shopping centre. The Franciscan emphasis on poverty and simplicity meant that the Church was smaller (reportedly '70 to 80 feet long and 30 feet broad') and more austere than the older foundations, but this did not prevent the accumulation of treasures, and it became a much sought after location for burial. In 1456 Edmund Tudor, 1st Earl of Richmond died of plague in Carmarthen, three months before the birth of his son, the future King Henry VII. Edmund was buried in a prominent tomb in the centre of the choir of the Grey Friars Church. Other notable burials were Rhys ap Thomas and Tudur Aled. 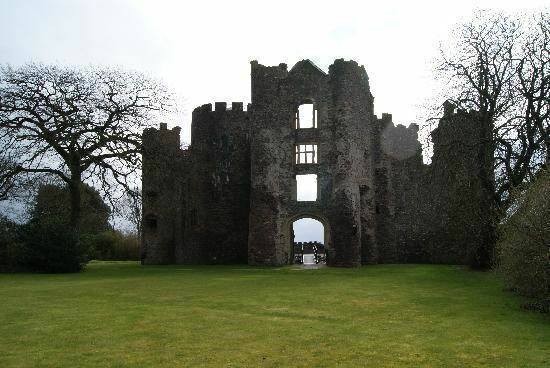 The Friary was dissolved in 1538, and many unsuccessful plans were made for the building. Even before the friars had left, in 1536, William Barlow campaigned to have the cathedral moved into it, from St David's. After its deconsecration Edmund Tudor's tomb and remains were moved to St David's Cathedral. There were repeated attempts to turn the buildings into a grammar school, which all came to nought Gradually the buildings became ruins, but the church walls were still recognisable in the mid-eighteenth century. However, by 1900 all the stonework had been stripped away, and there were no traces above ground. The site remained un-built on until development works in the 1980s and 1990s. This required extensive archaeological excavations of first the monastic buildings and then the nave and chancel of the church. It confirmed that the original buildings had been a church, chapter-house and a large cloister. A smaller cloister and infirmary had been added subsequently. Over 200 burials were found in the churchyard, and 60 around the friars' choir. According to some variations of the Arthurian legend, Merlin was born in a cave outside Carmarthen. Given that the town's Welsh name is Caerfyrddin, some say that Merlin may be an anglicised form of Myrddin. (See Merlin § Name and etymology.) Historians generally disagree with this interpretation of the name, preferring that Myrddin is a corruption of the Roman name but the story is popular. Further, many areas surrounding Carmarthen still allude to this, such as the nearby Bryn Myrddin (Merlin's Hill). A cycling track was established in the town in c.1900; it is still used. Speedway racing was staged in the early 2000s at a track built on the Showgrounds on the western outskirts of the town. The team raced in the Conference League. The town has two rugby union teams – Carmarthen Quins and Carmarthen Athletic. The Quins currently play in the Welsh Premier Division league after their promotion to the Premiership in the 2008/2009 season. CPC Bears are a rugby league club based in Carmarthen and are the regional side for Carmarthenshire, Pembrokeshire and Ceredigion. They play in the Welsh Premier Division of the Rugby League Conference. The town has its own football team, Carmarthen Town F.C. who play in the Welsh Premier League. The club was founded in 1948 and have played at their current home ground, Richmond Park, since 1952. The town has two golf courses, a leisure centre with 8-lane 25m swimming pool: home of Carmarthen district swimming club, a synthetic athletics track and an outdoor velodrome. Carmarthen has an athletics team, Carmarthen Harriers. Scott Williams, Scarlets Centre was in the Wales senior team against the Barbarians on 4 June 2011 as a second-half replacement.